Charles Woodman is an electronic artist working in video and expanded media. His recent projects concenterate on the integration of video with live performance, often in collaboration with musicians or dancers. Exhibitions of his work include screenings at the Museum of Modern Art in New York, Block Museum of Art, Chicago, Black Maria Film and Video Festival, Edison, NJ, and the American Dance Festival, Raleigh, NC. 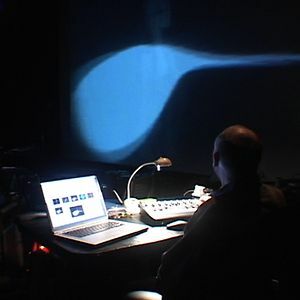 Woodman was a founding member of the video performance group viDEO sAVant and a pioneer in the development of Live Cinema - real time video editing as live performance. Recent appearances by that ensemble include ENSAD, Paris, Spazio Contemporanea in Brescia, Italy, ISEA, Dubai, UAE, and the Berkeley Art Museum in CA. Hwa park is a New York City- based costume designer. She attended the Mason gross School of The Arts at Rutgers the State University of NJ to achieve an MFA in Theatre Arts/Design and is a member of United Scenic Artist Local USA 829. Pate Conaway is a graduate of Chicago's Second City Training Center and received his MFA from Columbia College, Chicago. His work explores the connection between visual art and performance. After learning to knit, Pate spent five weeks at the Museum of Contemporary Art in Chicago knitting a pair of mittens large enough for him to sleep in. His work explores the fusion of sculpture, installation, and interactive performance. Insook Choi is an interdisciplinary composer, researcher and interactive media artist. She currently lives in New York City where she is directing the creation of a new Emerging Media program for the City University of New York. Born in Seoul, Korea, she has been teaching and conducting research in various institutes including UIUC, UC Berkeley, School of Art Institute of Chicago, and NYU-Polytechnic University, Brooklyn. Her music has been performed and broadcast in Europe, Asia and the United States. She has created numerous interdisciplinary projects across music performance, cognitive science and engineering. Her compositions include instrumental, electro-acoustic and computer music, video, and interactive performances involving various technology. She is frequently invited as a presenter at international festivals and conference venues, and her research publications can be found across the disciplines of art, science, and engineering. Rachel Thorne Germond with JT Newman's projected video - Splendor Twice/Gender Splendor (2005) performed at Dixon Place's HOT! Festival in New York, NY 2015.